New Zealand is known as a mecca for glow worms, but while most opportunities to see them involve hordes of tourists chattering away in underground caves or crammed into boats, there’s one experience that will bring the magic back. From Tauranga, a few hours southeast of Auckland, you can shirk the crowds for a kayak paddle by night into a gorge loaded with these glowing critters. The experience starts by quaffing some of New Zealand's finest wines along with a cheese and fruit platter that's guaranteed to sustain you through the paddle ahead. As the sun sinks, you'll get kitted up and pushed away from shore for a serene journey on mirror flat water accompanied by the call of water birds. By the time darkness has fully fallen you’ll be edged between the tight walls of the rocky gorge. It takes a few minutes for your night vision to kick in, revealing the pale green light of thousands of glow worms. This an intimate experience that really connects you to the nature you’ve come to see. There’s the sound of waterfalls, the spray of mist on your face, the twinkling lights of larvae fishing for food, and the glitter of a million stars above. Grab your paddles and get out there! It’s a 2 ½ hour drive from Auckland to Tauranga (buses take 4 hours). Waimarino Kayak Tours will drive you to the launch site. You’ll have to flex a few muscles for this one but it’s an easy river to paddle. Operating in the dark adds an extra degree of difficulty though. Pick a date outside of the full moon period to appreciate the glow worms at their brightest. 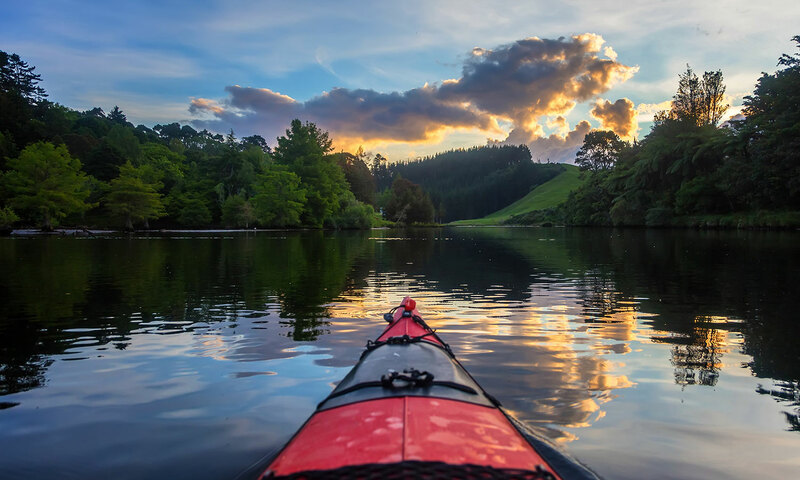 Waimarino Kayak Tours provide all kayaking gear including fleece tops and over-jackets.